With Combwich all ready for RAILEX, a last chance to knock up a quick video of Ex-Midland Railway 0-6-0 4F No. 44417 arriving at Combwich with the afternoon goods from Evercreech Junction. August 1961. 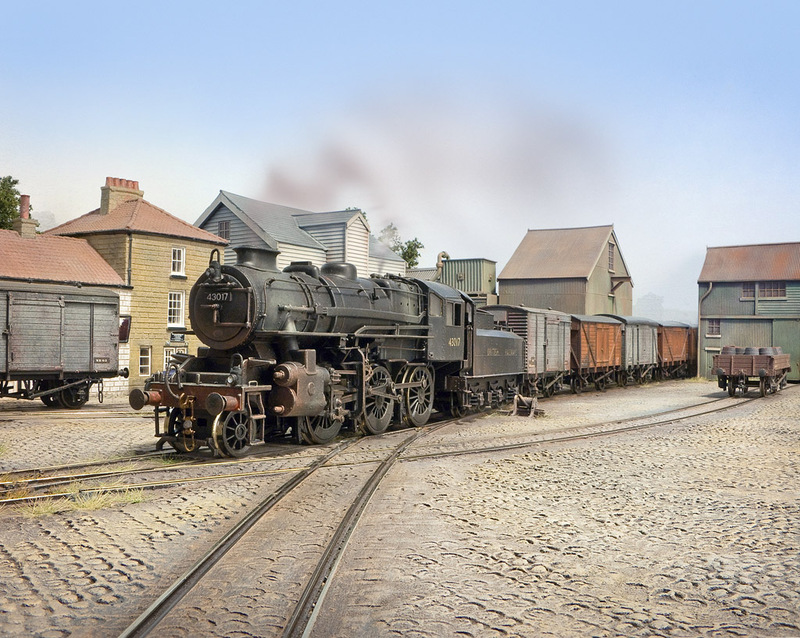 After arrival, the engine runs around its train, then shunts the short rake of old wooden wagons into the goods yard. nevard_101106_wycrail_IMG_8338_web, originally uploaded by nevardmedia. Combwich will be having a rare outing at RAILEX this weekend (28 & 29 May 2011). Tim Maddocks' excellent SDJR Enginewood will be right next door, and the intention is to run occasional trains between the two layouts. To add to the excitement of this rare operational marriage of layouts, it will also be a chance to see Model Rail's specially commission Sentinel in action - at least 2 months before the production models appear in the UK. Find out more about Combwich here! Find out more about Enginewood here! Find out about RAILEX here! Find out about the Sentinel here! Model Rail Magazine's Sentinel, taking around 2 minutes to traverse a mere 10 inches (that 25cm in new money) in the sidings at Combwich. See this loco running 28/29 May at Railex! Model Rail Sentinel at RAILEX! 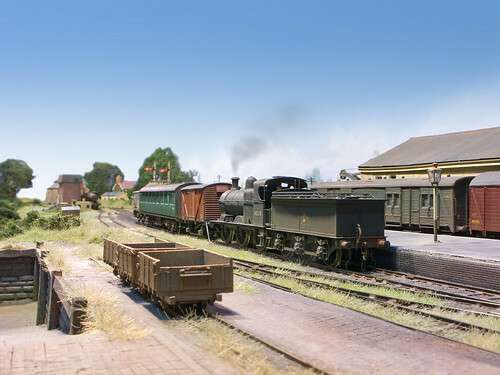 The proprietors of Combwich and Engine Wood are pleased to announce that it is planned to operate a service between their two layouts at Railex at Stoke Mandeville, May 28/9. Following successful negotiations with the manufacturer, a Model Rail Sentinel demonstrator is expected to operate this service. This is a rare opportunity for those who would like to see the Sentinel in operation. At the time of writing we understand that the models are in production and we hope to have delivery in August. See this loco running at Railex! Above is a video shot on Combwich demonstrates the very good slow speed performance over hand built track. Any juddery movement here will simply be the You Tube compression which tends to drop frames here and there - not the loco performance which is exemplary! nevard_110523_planet_IMG_9983_web, originally uploaded by nevardmedia. This evening saw the completion of the little Roxey Mouldings 0-4-0 Planet diesel. Brewhouse Quay has been put away for a few days while I prepare Combwich for this weekend's RAILEX, so makes as ideal background to pose the little beast on. The wagon in tow is an ex-LBSCR wagon from a Smallbrook Studios kit knocked up a couple of weekends ago. nevard_110522_planet_DSC_2188_web, originally uploaded by nevardmedia. The Roxey Mouldings Planet 0-4-0 Diesel has now been painted and is ready for weathering and glazing. There is plenty of scope really to go to town with rust spots and patched up paintwork. The nameplate from Narrow Planet is possibly a little large, but there again it's a very small loco. My excuse is that it is second hand! Named 'Fleur', here it is parked on the canal edge at Brewhouse Quay. This Planet is a little star! nevard_110516_planet_IMG_9904_web, originally uploaded by nevardmedia. Currently on the work bench, a Planet 0-4-0 Diesel from Roxey Mouldings. And here is the white metal kit after basic assembly. A little filling and cleaning up will be required before painting as well as some extra details. The body is just sitting on the chassis, and will be screwed properly into place once painted. 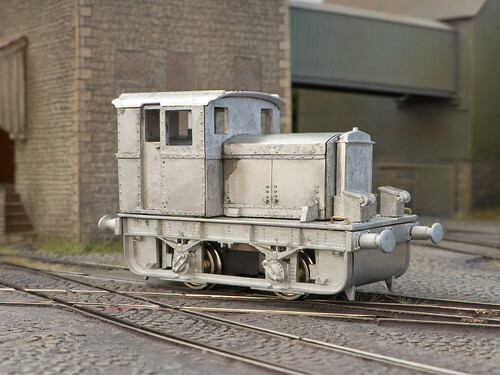 It sits on a Tenshodo WB 24.5 'Spud' which makes it ideal entry to white metal loco construction because of the ready to whizz chassis. 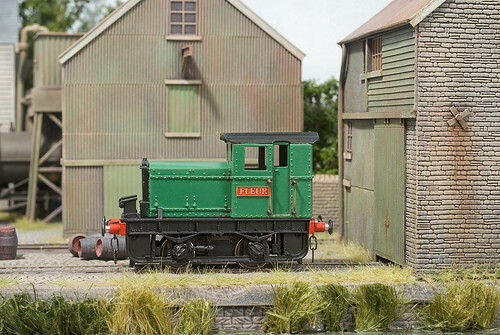 This is a small loco, length over buffers is just under 3 inches, and because of this ideal for Brewhouse Quay with its short sidings and tight curves. It will however be as just at home on some of my other industrial layouts. The plan is to paint in the same livery at my recent Austerity tank. I'll be naming this little loco 'Fleur' using plates from Narrow Planet. nevard_110510_J94_DSC_2172_web, originally uploaded by nevardmedia. After seeing Paul aka 'Halfwit's' post on RM web about further improving the Hornby J94 Austerity by filing away the large lump of supporting plastic which sits behind the pipework extending down from the footplate below the cab, the little loco was pulled back into the workshops for a quick fettle to follow suit. This view here of the loco midway through its detail and repaint a week of two ago shows the block of plastic reasonably well - OK, I should have taken a closer photo, but it's too late now. The above shows off the opened up pipework, and yes those flanges need a good polish! At first I thought this little job might be tricky as well as weakening the area, but this was not the case. Sitting outside in last week's wonderful weather did help to ensure than I could see what I was doing properly which the aid of a 1mm hand-drill and fresh Swann Morton blade. Total time? About as long as it took for my cup of tea to get tepid, no fear, I wanted a beer anyway! Whilst it's possible to do the same with the lower pipe which bends around under the steps, I decided to cut off the plastic pipe and replace it with some wire - an office paper clip in this instance! To finish off, the remodelled pipework was given a splash of 'gunmetal' coloured enamel after the paperclip was chemically blackened. I'm a fairly recent convert to 'gunmetal', having found it's great for representing oily metal, and it has the bonus of dry-brushing to a lovely sheen - thank you Darren Rees of Torrington for that tip! For more views of this loco go here. nevard_110510_minkD_DSC_2168_web, originally uploaded by nevardmedia. 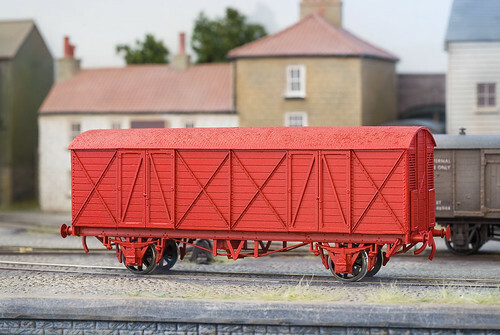 A Parkside Dundas kit of a GWR 'Mink D' Goods Van after assembly and a coat of BR Carmine courtesy of Halfords Ford Venetian Red. Obviously this wagon is not yet finished should anyone ask, the roof needs painting grey, the underframe black, then numbering, couplings and the all important weathering. Parkside Dundas kits are mostly a joy to assemble, with little flash and carving required to get them to fit together, with the basic assembly taking about an hour. However in this kit for some reason the brake shoe legs or arms or whatever they're called are about 3mm too short, so a little shim of plastic card was bonded to the underside of the chassis behind the solebars so the shoes hang at the correct height in relation to the wheels. Some of the chassis detail is supplied as thin plastic rod which will last about 3 minutes in the real world, so that was replaced with some suitable brass wire for added strength and fidelity. nevard_110511_LBSCR-8-tons-van-DSC_2157_web, originally uploaded by nevardmedia. 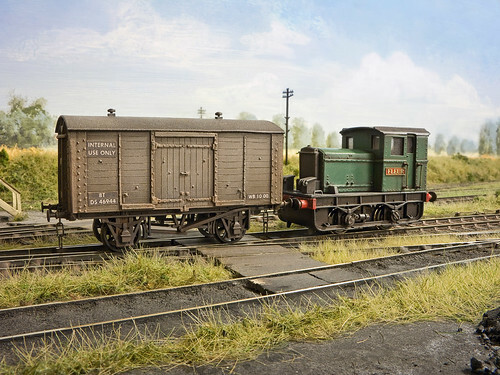 I've had this kit of a LBSCR 8 Ton Van in the 'kits to be done one day before I die box' since ExpoNG 2010, having bought it direct from the manufacturer Smallbrook Studios who are more well known for delightful resin based narrow gauge kits. 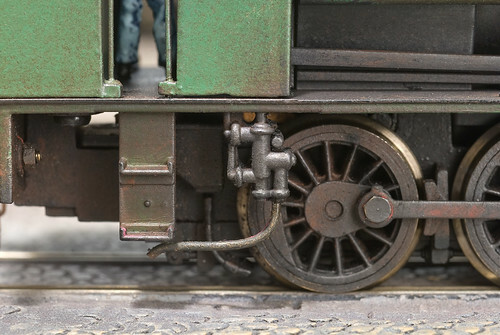 However, in addition to their more well known items, they also produce a small range of ex-LSWR and LBSCR prototypes in 4mm scale designed around the Dapol 10ft wheel base ready to run chassis, the kit prototypes being wagons that ended up on the Isle of Wight in their later years. Without going into too much detail, after all that's what the supplied instruction are for, here is the completed wagon after an afternoon's work. My depiction here, is a 'what if' should one of these wagons ended back on the main land in private ownership after finally running out of puff in the engineering section of the Southern Region. The numbering might horrify the purists, but they were simply home printed out onto self-adhesive label and stuck on rather than messing about with transfers (what is all this 'decal thing'? I'm English so 'transfers' it is - so there!). In real life, which will not be nearly as big as you see on your screen here, the paper numbering looks quite respectable. For the neurotics which I'm sure there are plenty, I'll just tell them that the wood was so rotten that some plywood was used as a base for the numbering. 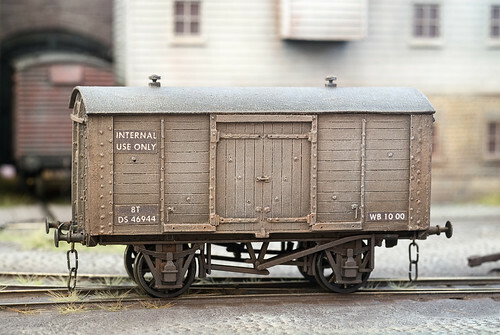 The wagon here is in quite a heavily weathered state, after its last overhaul it would have been pale grey or possibly even bare wood with the white numbering on black. A few colour washes and much dry-brushing has produced the excessive exposed to the elements look I wanted. For want of a BLOG post, rather than dwell on pretty photos and blarney, this one is about the journey so far, for Brewhouse Quay has to be one of the quickest layouts I've been able to get together. There is quite a bit more to do, but I think that layout at a push has reached the stage where I'd be happy to take it to a show. 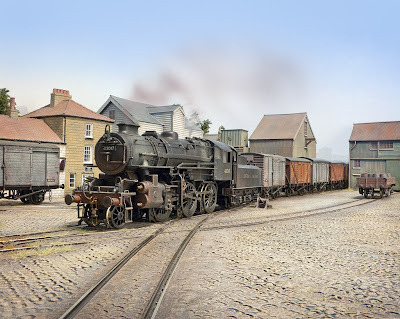 That however won't be until September at Model Rail Live in Barrow Hill Roundhouse. Any spare time over the next few weeks will be taken up tweaking Combwich for RAILEX, for that layout is 30 years old now and is a bit like running a classic MG or having a high maintenance wife - constant TLC required! Whilst the track is handbuilt, the buildings are 50/50 ready to plop/scratchbuilt, that definitely is has a speed advantage. Whether I'd use such a large ratio in the future is debatable - I prefer a more individual approach. However I was offered the brewery buildings as a freebee, and with these latest Scenecraft releases being extraordinarily good and above an beyond what I could achieve with the time I have available (model making is only a small fraction of my involvement within the hobby). Ivatt Class 4 No. 43017 of Bath Green Park arrives at Brewhouse Quay with the empty return beer train from London on a hot summers day in 1952. The following year, this same working would be fully fitted and given the nick-name 'The Beer Express'. The wagons are in fact parked on the headshunt, the backscene (actually there, not cgi) marks the end of the siding. After taking this shot, I'm tempted to punch a hole through the backscene and add a cassette yard for occasional use to allow trains to arrive like this.